Dawid Mocke is the personification of what we hope a sporting hero will be like when we meet them: athletic, strong, charismatic and intelligent, yet also funny, humble and very down-to-earth. He is an extremely accomplished athlete who has achieved the very best results at the highest level. He has won over 20 International Ocean Surfski titles and has been the Surfski World Series Champion for 4 consecutive years from 2009 to 2012. But being a World Champion athlete is not all there is to Dawid. Having completed a BA Information Sciences degree at Stellenbosch University in 2000, Dawid’s work life started when he assisted a friend to develop a software business. It wasn’t long however before he decided to leverage his passion to become his profession and set up a paddling business, the Surfski school in 2003. At his surfski school, Dawid shares his passion and knowledge with anyone interested in learning to paddle, irrespective of their age, gender or ability, and does so with patience, empathy and enthusiasm. This year (2013) the Surfskischool is 10 years old and going strong with similar schools established by Dawid in Durban and Port Elizabeth. Dawid began to surfski in his late teens as a surf lifesaver at the Fish Hoek Surf Lifesaving Club. During this time he represented South Africa on 3 occasions between 1997 and 2003. But it wasn’t until 2002 that he decided to take part in an “Open Ocean” surfski event, involving paddling one to two kilometres offshore and racing over twenty to thirty kilometres in all weather conditions. After that one race, he was hooked. He started competing in more and more open ocean events. In 2004 Dawid decided to put his skills against the world’s best and went on to win his first international competition in Auckland New Zealand, the King of the Harbour. He returned to Auckland a few times after that first win and successfully defended the title for 4 consecutive years. Since then, Dawid has added many other titles to his extensive list of feats proving not only his strength of consistency in any conditions, but also the tenacity needed to successfully defend titles once they have been won. The last 4 years have been his most successful and has established himself as the World’s number #1 surfski paddler. Paddling aside, Dawid is also a multi tasker. He actively tries to diversify his passion in other areas as well. 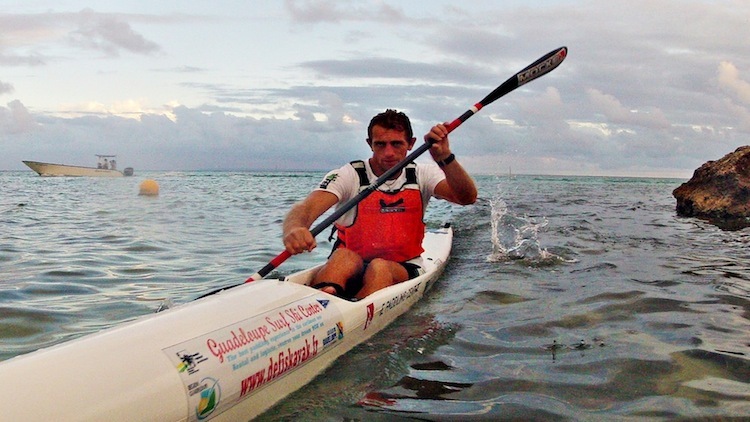 Late in 2007, Dawid opened The Paddling Centre, a paddling retail outlet in Fish Hoek, and has developed his own MOCKE brand of paddle gear and apparel which is manufactured to the very highest international standards. Dawid is also a committed environmentalist and is the global ambassador and driving force behind the NGO organization “Paddle for the Planet” the aim of which is to highlight the increasing damage being caused to our oceans, to drive home the fragility of our eco systems and to highlight the criticality of protecting and conserving the seas and life therein. As an open ocean surfski paddler he has had many experiences out on the open ocean, many of them exhilarating, and a good few of them terrifying. Dawid is a truly inspirational man. His physical toughness and mental strength become quickly apparent when you first meet him, but what isn’t immediately apparent is the depth of his commitment to his chosen profession. Unlike the professionals involved in major international sports, Dawid has to fund almost all of the costs associated with competing internationally himself. Because surf skiing competitions do not enjoy extensive media coverage, there are no large sponsors available to fund the competitors (even the top ones). Apart from a small sponsorship from the kayak brand FENN towards his travel costs, Dawid has to fund his participation from his own earnings and from the prize money he wins at international events. Only once this reality is fully comprehended does the scale of Dawid’s accomplishments really sink in. Dawid knows that he is extremely fortunate and blessed to have been able to turn his sporting passion into his job. In this regard he shares one of his favourite quotes: “There is nothing greater that a man can do than to find satisfaction in the work of his hands”. Dawid Mocke is an action man, deep thinker, proudly South African, a family man, entrepreneur, tough competitor and a very articulate communicator. He is a superb ambassador for businesses, brands and organisations, with which he is associated and which are synergistic with his lifestyle, philosophy and beliefs.